This genus is accepted, and its native range is Lesser Sunda Islands to N. & E. Australia. 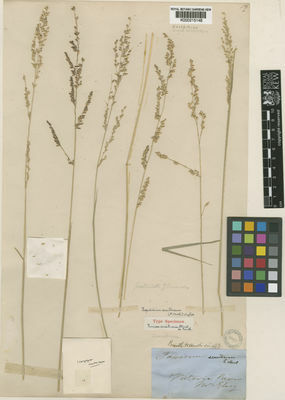 Annual (5), or perennial (2). 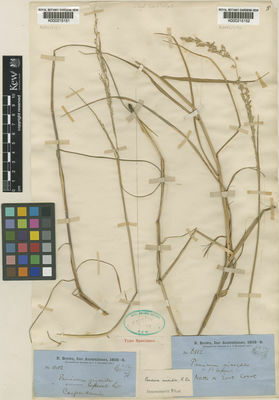 Rhizomes absent, or short (1). 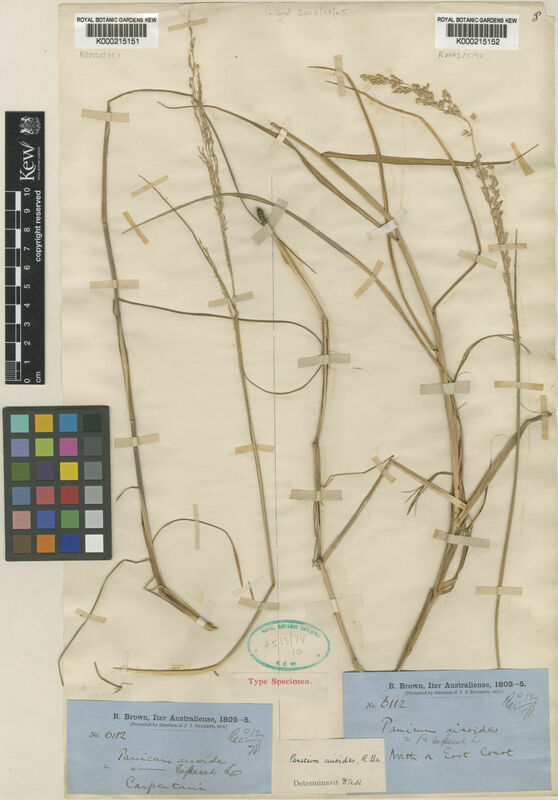 Culms 30-80.83-200 cm long; without nodal roots (3/3), or with prop roots (1/3), or rooting from lower nodes (2/3). Culm-internodes channelled (1/1). Culm-nodes constricted (2/2). Ligule a ciliolate membrane (5), or a fringe of hairs (1). Leaf-blade margins cartilaginous (4/4). 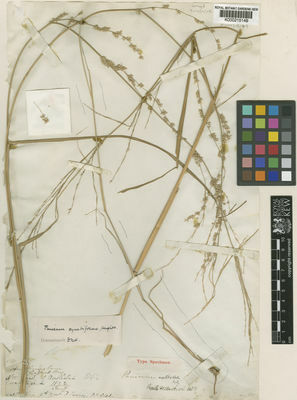 Inflorescence a panicle (5), or composed of racemes (1). Panicle open (5/5), or contracted (1/5). Racemes borne along a central axis (1/1); unilateral (1/1). Rhachis angular (1/1). Spikelets solitary (4), or in pairs (2). Fertile spikelets pedicelled; 2 in the cluster (1/1). Spikelets comprising 1 basal sterile florets; 1 fertile florets; without rhachilla extension. Spikelets elliptic (1), or oblong (5); laterally compressed; 2.25-3.104-4 mm long; falling entire. Rhachilla internodes elongated below proximal fertile floret. Rhachilla elongation slender. Glumes shorter than spikelet (1), or reaching apex of florets (5); thinner than fertile lemma. Lower glume ovate (3), or orbicular (1), or oblate (2); membranous; without keels (1), or 1-keeled (5); 3 -veined, or 4-5 -veined (3). Lower glume surface smooth, or scabrous (1), or tuberculate (1); glabrous, or hispid (2). Lower glume apex obtuse (1), or acute (5), or cuspidate (1); muticous, or mucronate (2). Upper glume oblong (4), or ovate (2); membranous; without keels; 5 -veined (4), or 6 -veined (3), or 7 -veined (5). Upper glume lateral veins ribbed. Upper glume surface smooth, or asperulous (2), or tuberculate (1); glabrous (5), or pubescent (1), or hispid (2); with simple hairs (1/3), or tubercle-based hairs (2/3). Upper glume apex acute (1), or acuminate (4), or laterally pinched (1); muticous (5), or mucronate (1). 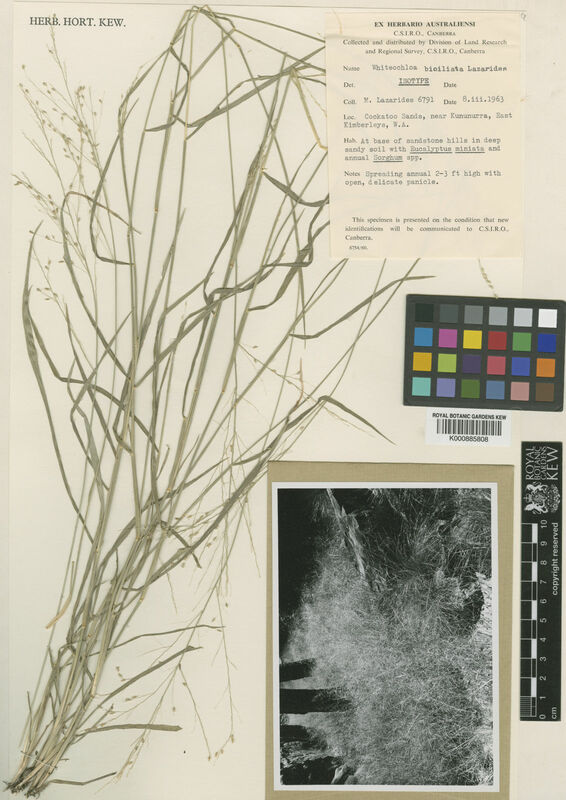 Basal sterile florets male, or barren (1); with palea. Lemma of lower sterile floret oblong (2), or ovate (4); scarious; 5 -veined, or 6-7 -veined (1); sulcate; obtuse (1), or acute (4), or acuminate (1). 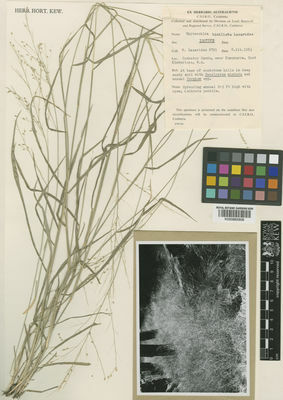 Palea of lower sterile floret wingless (4), or winged on keels (2). Fertile lemma elliptic (5), or orbicular (1); dorsally compressed; not gibbous (5), or gibbous (1); indurate; without keel; 3 -veined (1/1). Lemma surface smooth (4), or granulose (2); unwrinkled (4), or rugulose (1), or rugose (1). Lemma margins involute. Lemma apex acute (4), or acuminate (1), or apiculate (2). 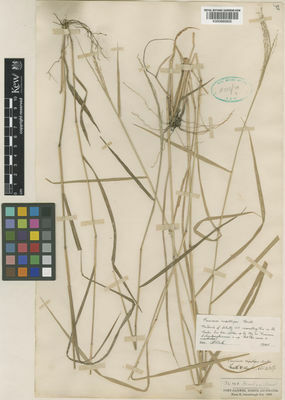 Palea indurate. Caryopsis with adherent pericarp; ellipsoid (5/5). Embryo 0.5 length of caryopsis. Hilum punctiform (1/1), or elliptic (1/1). Tropical Asia (1), or Australasia. 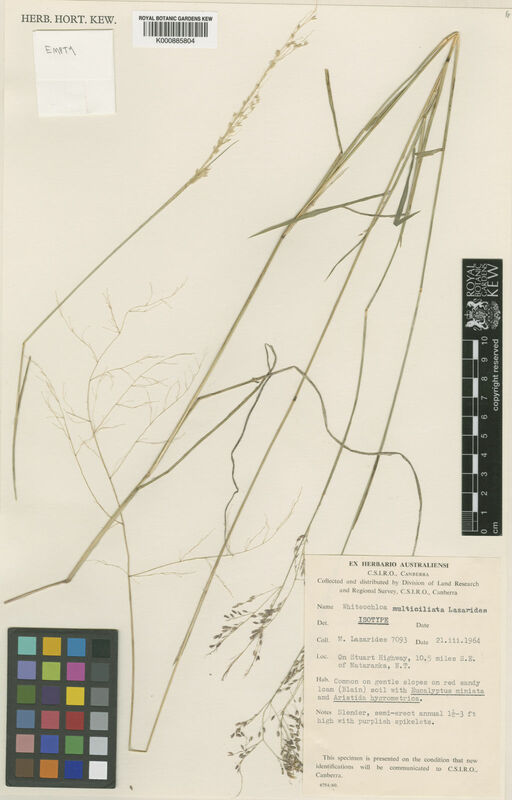 Whiteochloa semitonsa (F.Muell. ex Benth.) C.E.Hubb.